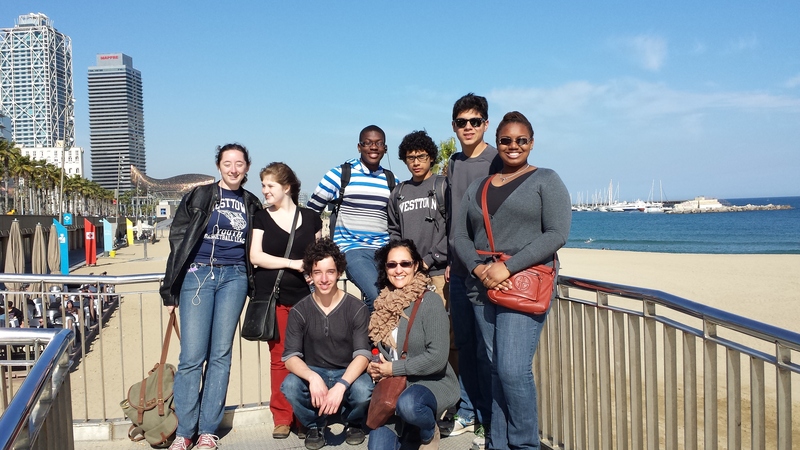 Our seven Westtown Exchange students were really excited to come to Spain with the purpose of reinforcing their Spanish language skills and knowledge. We “regret” to inform you that this intellectual exercise of understanding and properly function in the intense Spanish immersion environment has been quickly abandoned, for a most challenging and thrilling pursuit; the pursuit of cultural enlightenment. After experiencing how the local cadence, gestures and accents of the language sound so foreign and illogical in different Spanish cities, (compared to anything that they had experienced in the classroom) they realized that there is “more to language in life… but don’t ask me what!”. Their Westtown language classes had prepared them to speak their minds; however, Andalucía and Cataluña made them realize that, all what they needed to do was Breathe (Respira), Look (Mira) and Listen (Escucha). Respira…and rejoice! The joy of breathing warm air in Madrid for the first time in too many months was the kindest welcome of the land. No matter how tired and worn out we might have been from our travels, the gift of “breathing it all in” energized us. Each day has had glorious sunny weather, while getting around a new place can also be incredibly frustrating. The arrival to Sevilla felt like an isolating experience for some, and a thrill ride for others. In either case, we began each day gathering in air in our lungs and launching our speedy steps in all directions through the narrow cobblestone streets and alleys of Sevilla. In each Place, we “took it all in”, but could not keep it all to ourselves for long. The day trip to Granada and The Alhambra took all our breath away, and so began our “exchange”. Mira! The Andalusian region is built on top of layer upon layer of rocky land and historic buildings. Each layer conveys a story of great importance in the history of mankind, from early human civilizations, the Roman and Islamic Empires, the Christian Reconquista to the seat of the colonial expeditions to America until present day. In essence, we witnessed a bountiful panoramic view of history that can only be summarized by this visual exhortation. Escucha. Each day consists of a fast-paced list of guided sightseeing activities. One student shared that it was hard to process all the information he was receiving just by listening during this trip. “I don’t know what is important and what is worth ignoring!” I’m sure memory and time will sort it all out. We do not need to hold on to so much in order to enjoy where we are. It is during the pauses and quiet times between each activity that we find the sounds of “Place” and share informally the wisdom learned with each other. A quick glance, a sigh, a grimace, a giggle…we do not need to pick a language on these instances. We all pull back and let our ears listen, letting our minds “understand” each word spoken from the physical aspects of the place. In the Alhambra, the soft flow of water in the garden fountains of the palace led us to explore all the rooms in the castle. In Cordoba, the tight alleys and streets of the Judería echoed, bouncing our words back to us in defiant confusion. In the last few days, as we begin our stay in Barcelona, we are deciphering the coexistence of the Catalan and Spanish (“Castilian”) language spoken in this region. Had we not learned at this point to “breathe and look” for clues of context and the interlocutor’s sense of urgency, our minds would have reached la “locura”! As we begin the last part of our trip, we are truly grateful for the wonderful hospitality and exceptional accommodations that the Aula Ecola Europea’s host families have provided for our students here in Barcelona. We look forward to Aula’s exchange student visit, when we will have the opportunity to return the attentions, host them warmly (Think Spring!) and show them the fascinating air, views and sounds that Westtown has to offer.